Can I make page turning book auto flip when start up? Q: I want to convert a report in PDF format to page turning book, and for displaying in the meeting, I would like to make it auto flip when start up. Can your software realize this for me? If can, what should I do? A: Yes, Page Turning Maker software can fulfill your requirement. Step 1 : Launch Page Turning for PDF and import report. 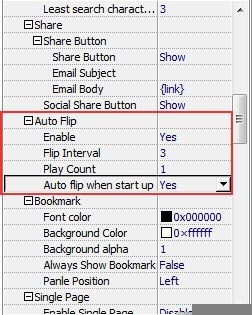 Step 2 : Search Design settings box for option "Auto Flip", then check "Yes" on option "Auto flip when start up". Step 3 : Choose "Apply Change" button to confirm your setting.